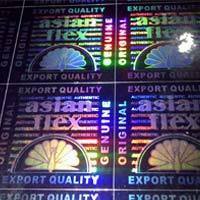 Leading Manufacturer of 2d 3d holograms, 2d and 3d holograms, 3d hologram sticker label, 3d hologram stickers and 2d and 3d hologram masters from Bengaluru. It contains many optical layers that contain 2D hologram images which are visually placed one behind another. This results in arriving at a 3D effect as each layer is placed at a different distance to our eyes in terms of visual depth. Usually, these images comprise thin lines which can be visualized at large angles of diffraction. 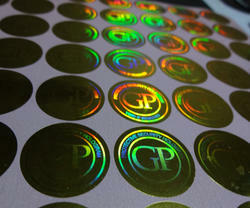 Virtually any existing design/logo can be turned into 2D / 3D hologram while working with its depth and parallax. Here, our expertise lies in working with you towards creating 2D/3D artwork through use of several software. Further, our expertise also lies in breaking existing artwork into separate color separations as well as layers that contain 2-4 layers as well as up to 6 colors. Our mission is to create a highly technological 3D Holograms to benefit in the combat against security issues, which include theft, counterfeited products and fraudulent documents. We manufacture the broadest line of security products, from simple 3D Holograms for small businesses to complex and special hologram devices for the Government and Corporations. 3D Holograms will insure authentication, protection and taxation. 3D Holograms multi-dimensional images appear when held under certain light. A unique feature of the 3D Holograms is the "parallax" which is the ability to see a scene and colors from many angles and depths. The colorful effect comes from microstructures within the holographic tape, which cause diffraction of the light hitting them. 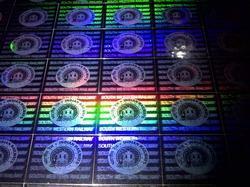 We are one of the leading manufactures & suppliers hologram products. 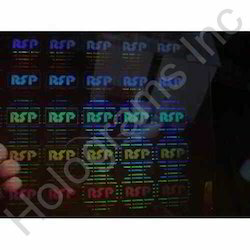 Looking for 3D Hologram Sticker ?